Modern browsers make no difference whether an image is in SVG, PNG or JPEG. Simply embed all of these using the „<img>“ element. 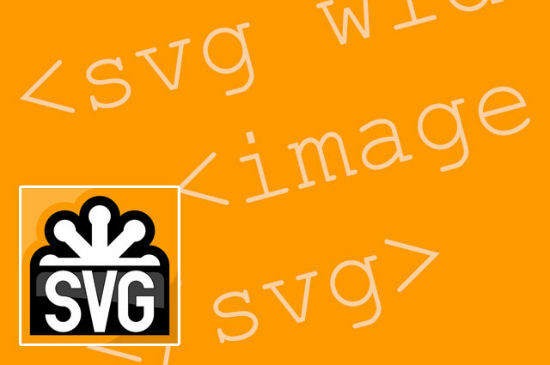 An alternative is the „<svg>“ element to be more specific. Yet as older versions of IE know neither SVG as a format nor as an element they will simply ignore it. External SVGs are linked in via Xlink and the „<image>“ element. Curiously enough all non-SVG versions of IE will take the „<image>“ element as the similarly named „<img>“ element. As soon as we use the „src“ attribute to embed a JPEG, IE will display it. All browsers supporting SVG and the „<image>“ element properly will instead display the SVG file. In the above example we link in an external SVG per „<image>“ and the correct attribute „xlink:href“. The incorrectly set „src“ attribute will be ignored by all modern browsers. Only Internet Explorer from version 8 downwards will recognize it and display the JPEG alternative – incorrectly, but intentionally set by the designer. The trick works for inline SVG as well. Use the „<image>“ element, but omit the „xlink:href“ attribute. In the above example we draw a red arrow as an SVG. Older versions of Internet Explorer will ignore that and display the JPEG from inside the „<image>“ element. Another working option to provide a proper fallback is by the use of the „<object>“ element, which is also able to embed an SVG into a document. Inside this object we’ll use the „<img>“ element to provide the fallback file. Note that is important to not attach the correct MIME type „image/svg-xml“, but something incorrect such as „text/svg+xml“. This is mandatory to force the Internet Explorer to display the content of the „<img>“ element. Modern browser are tolerant enough to display the SVG regardless of the wrong MIME type. Fallbacks for CSS work following the above mentioned principles. Only that we are going to use CSS properties the older IE is not able to understand. Say we want to display an SVG as a background we’d use the CSS3 method of embedding multiple backgrounds. On multiple backgrounds we will need to use the common „background-image“ property and, yes, you are right, older IE supports that too. Yet, the trick is, we add more than one file, comma delimited. IE 8 and below will take that as reason enough to ignore the property as a whole. In our example we define a background using multiple files. The second file is set to „none“. This is sufficient to make older browsers ignore the property completely. Then we go and define an additional „background-image“ property with just one image in JPEG and place it right before our multiple background definition. Older browsers will display the JPEG and ignore the second statement. This is how it goes. Normally the first property would be interpreted by all browsers, but the first gets overwritten by the second as soon as a browser is able to recognize SVG correctly. Unfortunately this fallback method will not work for all properties embedding files via „url()“. Other than with „background-image“ „list-style-image“ does not provide any such possibility. There simply is no CSS3 variant that would be unsupported by older browsers. I did a rewrite in htaccess for all SVG files to PNG if the UserAgent contains MSIE 6 till 8. Works like a charm. Or do you see any flaws in this solution? That’s a great alternative for svg fallback. I’m using Modernizr for a long time now. But your way is much better. Thank you. Do you also have a solution for the problem when you scale a svg in a responsive website, in IE browsers the svg doesn’t scale in a proportional way.